"Sampath Speaking" - the thoughts of an Insurer from Thiruvallikkeni: England in dumps at Perth ..... Billie Bowden loses count !! England in dumps at Perth ..... Billie Bowden loses count !! Perth is not that green a top as I described earlier it to be… still England find themselves hoplessly placed ~ trailing 0-2 – now Aussie lead England by 369 runs with 7 wickets and 2 days to go…. 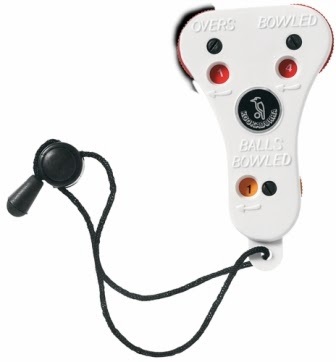 Warner made a fast hundred today… adding to the dejection of visitors..
A basic guide to Umpiring instructs …….. ‘have six (6) stones or coins (plus one in your other pocket in case of losses)’ so that you can count the number of balls in each over. Perhaps old time….not any longer…. Now-a-days most Umpires use counters…….. mechanical contraptions…. Where there are efficient scoreboards, the umpire does not need to make any other check; he only has to see that every run is recorded. But most often, an umpire has to make his own record of runs. For this purpose simple clickers where each click increases the display by one, is commonly used ~ this man is in news because – he forgot to carry the pebbles or the counter… perhaps !! 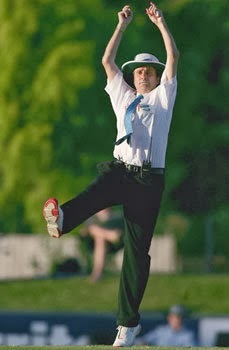 He is famous ~ fans in India know him too well….. Brent Fraser "Billy" Bowden from New Zealand. He was a player until he began to suffer from rheumatoid arthritis and took up umpiring. He is well known for his dramatic signalling style which includes "crooked finger of doom" out signal. His umpiring debut was in Mar 1995 in a match between Kiwis and Lankans at Hamilton… In Mar 2000, he officiated in a Test; in 2002 he was included in the Emirates Panel of International Umpires; was duly promoted to the Emirates Elite Panel of ICC Umpires, of which he a member till 2013. Bowden, from his inclusion in the Elite Panel of ICC Umpires in 2003, umpired in 75 Tests, 181 one-day internationals and 19 Twenty20 internationals. He was dropped from the ICC Elite Panel of Umpires after an annual review of performance in June 2013. It is stated that suffering from rheumatoid arthritis, it was too painful for Bowden to signal a batsman out in the conventional fashion, with a straight index finger raised above the head, and this led to the "crooked finger of doom". He has also put his own slant on several other signals, including a "crumb-sweeping" wave of the arm to signal four, and the "double crooked finger six-phase hop" to signal a six. To his critics, everything is exaggerated, with arms and legs flailing as if he were a trapeze artist on the high wire. A four is met by a great arc of the arm sweeping across his body as the back leg slides out, a balletic act Test Match Special's Henry Blofeld describes as fit for a "walk on part at the Opera House". A leg-bye in the NatWest Series was greeted thus: "He taps his leg and shakes it. If it was butter it would be milk by now". Bowden's compatriot, former Test captain Martin Crowe, has been less than complimentary, describing the umpire as a "Bozo the Clown" character instead of one of the stars of the Big Top. Even as one thought that the Word has seen him enough, Tony Hill, his fellow countryman made a series of errors during the Ashes series in England in the winter, and was sidelined from on-ground officiating this summer ~ opening the doors for Billy again. The other umpires from the series in England - South Africa's Marais Erasmus, Kumar Dharmasena of Sri Lanka and Pakistan's Aleem Dar - are all there to officiate. Billy Bowden was back for the Perth Test but is expected to move to TV box in Melbourne. ~ and that was decided much before the present gaffe…. !!!! Recalled to adjudicate a Test match for the first time since being dumped from the ICC's elite umpiring panel midway through this year, Bowden was clearly so gripped by the intensity of an Ashes contest that he forgot how to count. Twice in the space of six overs, Bowden failed to call "over" at the correct time - cutting the 39th over bowled by Stuart Broad to five legal deliveries (six balls were bowled, but one was called a wide), then making Ben Stokes run in for a seventh delivery in the 45th over. The Elite Panel of ICC Umpires is a panel of cricket umpires appointed by the International Cricket Council to officiate in Test matches and One Day Internationals around the world. The panel was first established in April 2002 when the ICC decided to reform the way that international cricket was umpired. The main change was that both umpires in a Test match and one of the umpires in a One-day international are now independent of the competing nations, whereas before 2002 just one of the umpires in a Test was independent and in ODIs both umpires were from the home nation. Sadly, there is none from India in the present elite panel…. While there are some who keep making mistakes – Bruce Oxenford will readily come to my mind....~ and writing of this incident, I do not understand why the off-field Umpire should not intervene in such cases.. !! !